The Rapido Trains F40PH-2D is based on diesels built between November 1986 and April 1989 by GMDD in London, Ontario. A total of 59 state-of-the-art F40PH-2D locomotives were purchased by Via Rail Canada. Delivered in the trademark yellow Via nose but with a light gray carbody featuring a blue banner stripe, they quickly became the mainstay of Vias fleet and continue to be used on most services throughout the Via network today, albeit rebuilt with a modified carbody from the 2009 remanufacturing program. This version of the F40PH-2D is the as-delivered body type. 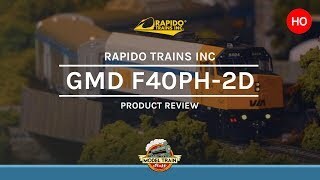 The Rapido Trains HO Scale GMDD F40PH-2D features prototypically accurate Canadian details, roadname-specific detailing, etched-metal grilles and details, full underbody details, full cab interior, working ditch lights, headlights and class lights. The drive features a five-pole, skew-wound motor. Optional GMDD F40PH-2D details such as an air conditioning unit, bug deflector, and later style air filter screens are included as appropriate.